Tiganopsomo (fried bread with feta and herbs) for your Greek breakfast! As you know we love making breakfast for our guests at Odyssey and taking care of our visitors in the morning. 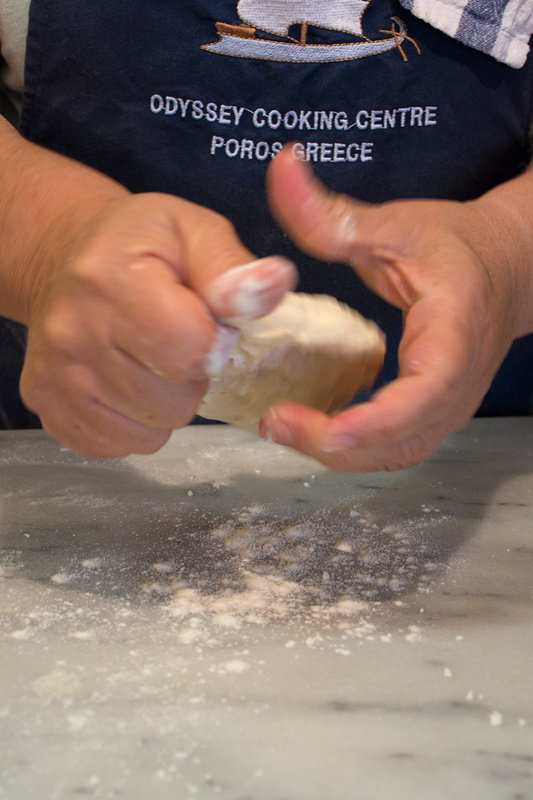 We want them to know the traditional recipes and products of Poros. For this reason I was very honoured to be among the people to promote the Poros breakfast during the Greek Breakfast event in Athens February 10th and 11th. We demonstrated how to make Tiganopsomo, fried bread with feta and herbs, a recipe that I will gladly share with you on this blog! 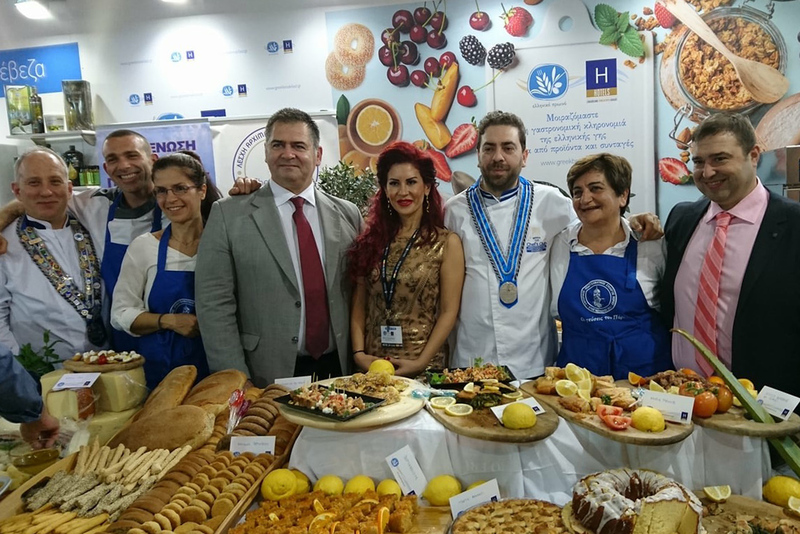 The Greek Breakfast event was held during the annual HORECA exhibition. This is an international exhibition for the provisioning and equipment of the hospitality and food industry in Greece; very important for the Greek economy and the future of my country. The Hellenic Chamber of Hotels and it’s board member Giorgos Pittas organised Greek Breakfast. Mister Pittas is the owner of the amazing website the Greek Gastronomy Guide. He is the initiator of forming, declaring, deploying and recording the local traditions and tastes of Greece in all it’s different regions (you can read all about his visit to Odyssey last spring on the previous blog). The goal of Greek Breakfast is to encourage hotels in all of our regions to serve the Greek breakfast using their local products and recipes. Mister Pittas creates these breakfasts all over Greece. It’s revolutionary. 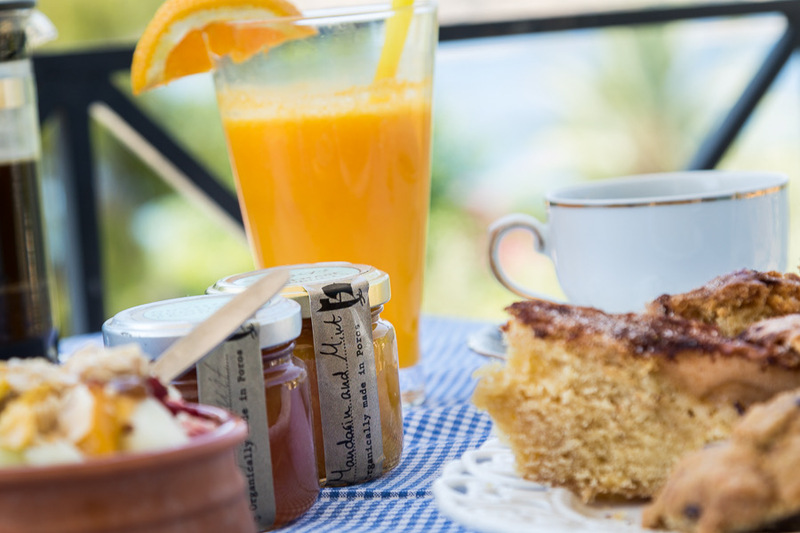 Thanks to their hard work many traditional Greek breakfasts are served these days and Greek hotel owners are much more aware of the importance of the local products and the gastronomical identity of their area. Something we at Odyssey were very excited about, was that Poros was chosen to present it’s local cuisine and products during this event. We did this with a great team of people from Poros: Dimitris Sixeris, Pantelis Kounelis and 2 other cooks from the island, Alex Papadopoulos and Chrisa Tzanetopoulou. We let the visitors taste the Poros breakfast and we demonstrated how we make a few of our breakfast dishes. The base of a traditional Greek breakfast is bread, rusks, olive oil, olives, yoghurt and fresh fruit. For the Poros breakfast we demonstrated Strapatsada; a traditional Greek omelette with tomato that resembles scrambled eggs, together with local sausages. We also introduced people to our wonderful Wild Greens Pie with homemade filo. Of course breakfast is not complete without fruits; we made a fresh salad of oranges, mandarins, sesame seeds and local honey with lemon skin for the aroma. I was also very pleased to make the same bread I made for mister Pittas during his visit to the Odyssey. 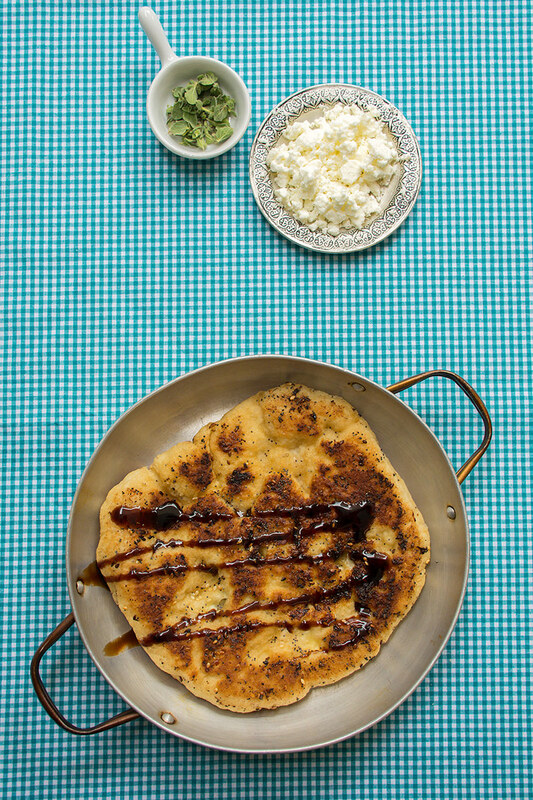 This bread is called Tiganopsomo; bread filled with feta and herbs fried in a pan. Tigani means frying pan and psomi/o means bread. We fry the Tiganopsomo with olive oil and traditionally make it in the morning with part of the dough we use for our other bread. The herbs can be a mix of rosemary, mint, parsley, sage and oregano. When the bread is ready we serve it warm and topped with local honey or balsamic vinegar. I hope if you ever visit Greece, you get to experience and taste a real Greek Breakfast. We at Odyssey will be happy to serve you one! 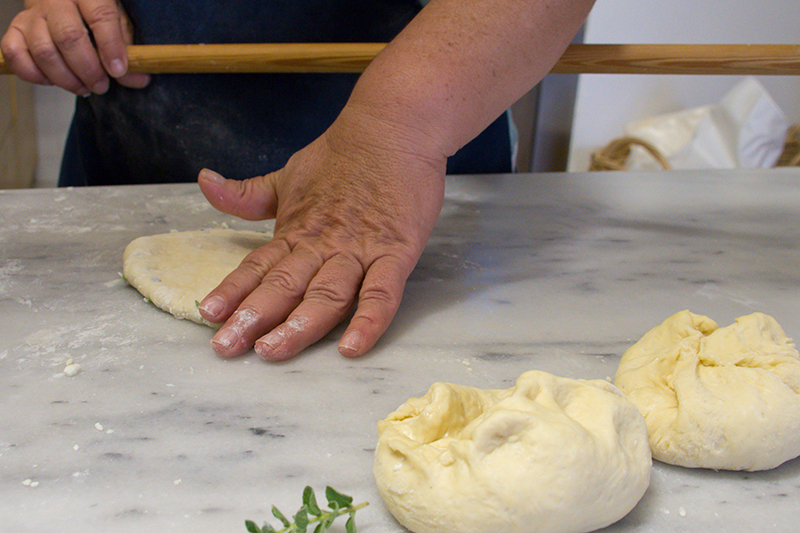 To make Tiganopsomo, we first prepare the dough and separate it into 6 small balls. Flatten each ball with a roller. Add to each of them a part of the feta cheese and the herbs. 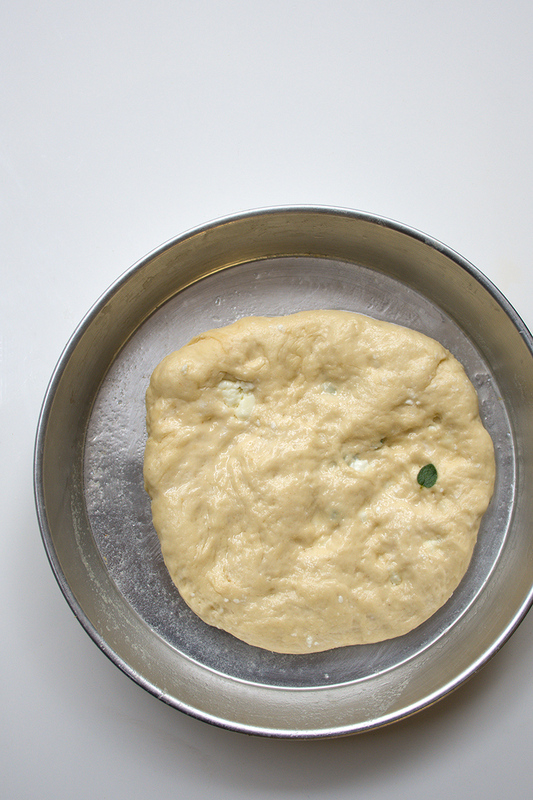 Fold the dough around the feta and herbs and flatten it again. Bake the Tiganopsomo in a frying pan with olive oil on low heat until they turn golden brown. Turn the bread often! Serve the Tiganopsomo on a plate with some honey or balsamic vinegar on top! Mix all the ingredients until you have a soft dough, let it rest for 30 minutes. Separate the dough in 6 small balls and flatten each one with a roller. Add to each of them a part of the feta cheese and the herbs. 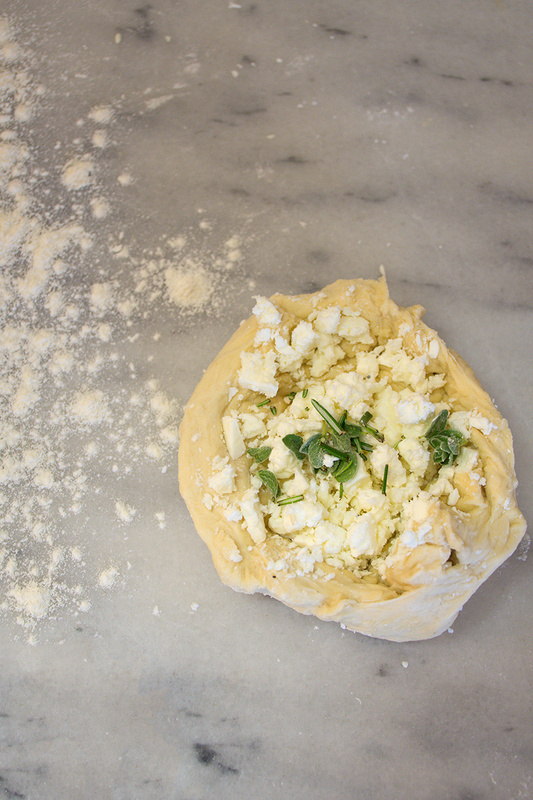 Fold the dough around the feta and herbs and flatten it again. Bake the bread in a frying pan with olive oil on low heat until they turn golden brown. Turn the bread often! 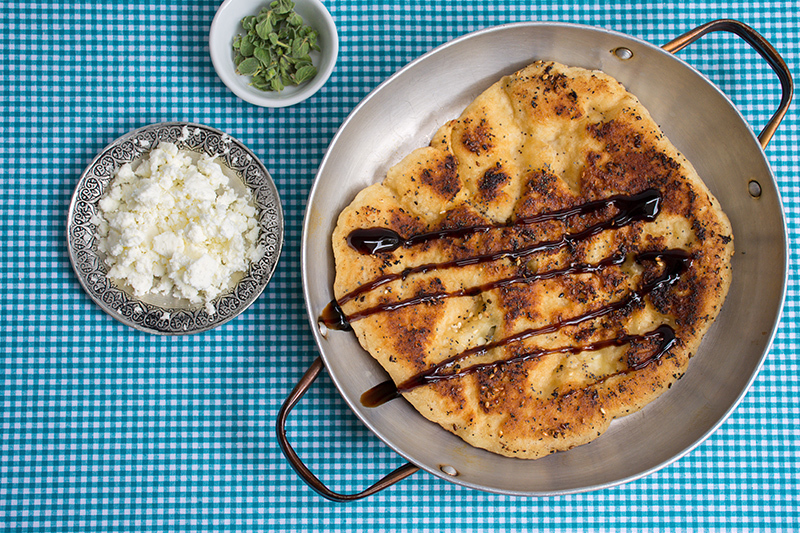 Serve the bread on a plate with some honey or balsamic vinegar.